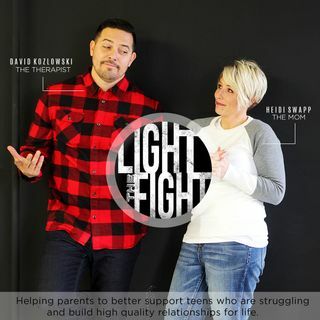 Heidi Swapp, a wife, mom, entrepreneur and influencer of women, teams up with David Kozlowski, a licensed marriage and family therapist to create a podcast that brings light to tough topics related to personal and family relationships. This unlikely duo was brought together by the death of Heidi’s son Cory, who passed away from suicide in July of 2015. Heidi and David discuss information, tools and strategies that have helped her these past few years to learn, grow and understand the ... Maggiori informazioni complexities of these relationships. Heidi is not a typical mom, and David is not a typical therapist. The unique combination of relatable info, sense of humor and honest expression through personal stories makes this show a ‘must listen’ for parents who are genuinely looking for help to connect with their kids, and improve the quality of their relationships. #055 "Question and Answers 2.0"
#054- "Statements Vs. Questions 2.0"
#053- "To Share or Not to Share?" #048- "Its Been One Year!" #047- "How to Instill Confidence in Your Kids"